BRONCO MENDENHALL: Good to be with you. A shortened week is always a challenge, and especially later in the season. A lot of urgency around our program, working to prepare, anxious to continue in ACC play and against a really good opponent. Again, really glad that we’re home, and looking forward to that being an advantage for us. I’ll be glad to take questions. Q. You guys have been so good against the run the last couple of weeks. How much, if at all, does it change your approach against a team such as Pitt that comes at you with so many different angles and from so many different positions, quarterback, wide receiver, several tailbacks? 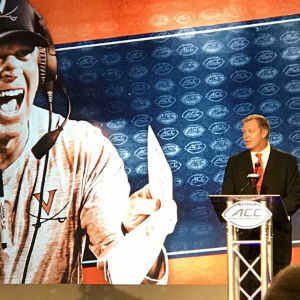 BRONCO MENDENHALL: Yeah, it’s a significant challenge, and certainly it’s different from the past number of weeks where the types of runs have been more traditional and the approach has been more traditional. So this is certainly not triple option football, but it’s just short of that in terms of preparation and the work that it takes to prepare for. We’ve been working really hard and diligently, and hopefully that’ll show. Q. Along the same lines, Kelly was talking about everything they do pre-snap. Is this as complicated a blend of kind of pre-snap confusion and then post-snap physical as you guys will face? BRONCO MENDENHALL: Yeah, that’s the exact way to say it. It’s really a challenging blend. Some teams that have a lot of the pre-snap and motions and shifts and different things before the play are more finesse oriented after the play, and that’s why they’re doing those things is to try to get angles and advantages and to try to get your eye control to be in different places. This particular team does all that, but then certainly they’re not compensating for lack of physical play. They are physical, as well. When you put those two things together, I think it’s a really unique and effective style. Q. And this is unrelated, but the past two seasons they’ve been able to break big plays in special teams against you guys. I know they’ve returned three kicks for touchdowns already this year. What do you see in that phase of the game, and how important will that be? BRONCO MENDENHALL: Yeah, just really well-coordinated. The returns aren’t accidents. They were executed and earned, and yeah, unfortunately their special teams I think has been one of the key reasons over the past two years that they’ve won the game, because they’ve won the special teams battle, especially the return game. And so we’re working to catch up and see if we can do better this year, knowing how important that is. Q. Pitt has faced a lot of mobile quarterbacks already this year, maybe nobody quite like Bryce Perkins, but what have you seen from them defensively when they’re trying to contain a guy who can make a lot of plays with his feet and do damage that way? BRONCO MENDENHALL: A lot of times there’s just an additional increase on rush lanes, if it’s traditional four-man rush. If it happens to be man free coverage, a lot of times that means leaving linebackers in the box because there is secondary match-ups that allow the backers to stay in, which again, the conflict just shifts. So while you have extra players on the quarterback, you have less in coverage. And then there’s certainly pressure, and so I think Pitt, they do a nice job of blending not kind of tilting one way or the other but kind of blending all the varied approaches to try to keep you off balance a little bit, to have that collective plan handle quarterbacks that can move. Q. And the other thing I was going to ask you, Pitt has got a lot of guys on defense who have been pretty steady, but they lost probably their closest thing to an all-conference type of guy with Quintin Wirginis in the middle. Is there anyone that stands out as being consistent on that side of the ball? BRONCO MENDENHALL: You know, not necessarily, but I’m probably the worst coach to ask in terms of really highlighting a personnel. I view things much more collectively and much more holistically than that, and occasionally a player will just emerge saying, man, I really like the way he plays. But my style and the way I view, I prefer to have kind of no-name offenses and defenses and just kind of viewing the collective, and so I would say that’s kind of where Pitt is, where I think they’re well-coordinated and they have good players, but I focus on their collective more, so I can’t highlight or single out any specific player other than just their collective. Q. Talk about how you contain Pitt’s two-headed monster at running back because they rushed over 100 yards apiece against Syracuse a couple weeks ago. BRONCO MENDENHALL: Yeah, it’s a real challenge, not only at the running back position but their quarterback is very mobile, as well, and then they have receivers that run the fly sweep. And so yeah, they spread you very thin. It really becomes assignment football. It becomes a collective effort that has to be well-coordinated defensively, and you certainly, again, have to be really strong in terms of tackling and have really good eye control because with the number of run attempts, then there’s play action pass. So yeah, big test for us. Q. And do you like playing on Friday nights, or do you prefer Saturdays? What do you prefer? BRONCO MENDENHALL: You know, I think there’s merit to both. It’s a real challenge to be ready for an earlier game, meaning a day earlier or sometimes two if you play on a Thursday. But there’s a sense of novelty and there’s a sudden change and kind of a spark that’s added and maybe a different type of urgency around the office and the players, and sometimes as a community it’s fun to have just another event on a different day to go to, especially in the evening, as kind of a special occasion. I certainly would prefer Saturday as an every day of the season kind of approach, but I don’t mind Fridays, and I think there’s benefit to them on special occasions, especially if you’re playing well, so we’re excited about it. Q. Kelly touched on this a little bit yesterday, but just curious to get your thoughts on just the availability for Tim, Joey, for all of the different guys on the defensive side that got a little banged up. BRONCO MENDENHALL: Yeah, so all are expected to play and are returning to full health. Yeah, uncharacteristically we’re kind of gaining help as the season goes, not losing it, so we’re excited about that. Q. What do you think of the new redshirt rule with the four-game thing and how it creates sort of a fine line between using a guy and possibly burning his redshirt? BRONCO MENDENHALL: Yeah, I just really like the flexibility. Injury is always something that we’re dealing with, and getting a clear understanding of who your team is and what the chemistry is and what players play what roles and having a four-game buffer with freshman eligibility just helps manage every one of those things. Certainly there is a back-end stress point of how do you manage, but that’s a flexibility we haven’t had, and the benefit of four games certainly to me outweighs kind of the decision making that you have to deal with that comes with it. Q. You probably expect to see Carter Friday night? BRONCO MENDENHALL: I think you have to as an opponent. You have to expect that and prepare for that, and then in the event that doesn’t happen, you’re prepared anyway, and I don’t think that’s a downside.